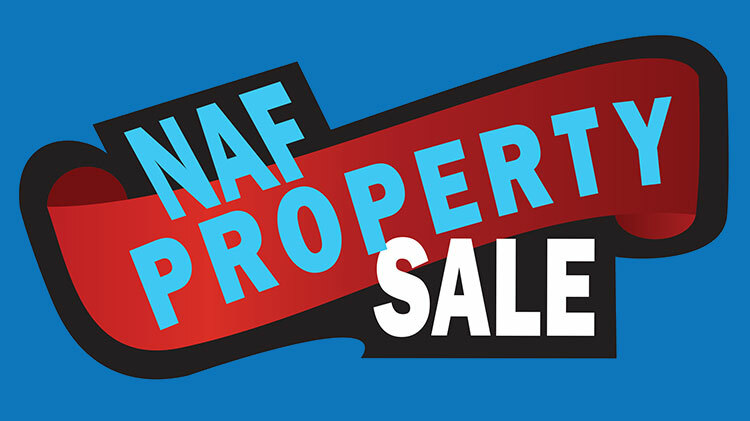 ANSBACH, Germany – USAG Ansbach Morale, Welfare and Recreation (MWR) is hosting a sale of NonAppropriated Fund (NAF) property for U.S. ID-Card holders Saturday, Feb. 24 from 10 a.m. to 2 p.m. at the East Wing – Building 5805, Katterbach Army Airfield (two doors down from the Bowling Center on the Katterbach Boardwalk). U.S. ID-Card holders will be allowed to browse the NAF sale in an open-market style facility, allowing them to pick and choose items they wish to purchase. All shoppers must present a valid U.S. Forces Identification Card to enter the facility, only U.S. ID-Card holders will be permitted into the shopping area (no sign-ins, no non-ID-Card holder guests). Patrons should bring along with them the necessary materials to collect, carry, load and transport their purchases in and outside the store area. All purchases are “Cash and Carry” which means the purchaser is responsible for removal and transport of all items purchased from the premises by 2 p.m. All sales will be cash, in U.S. Dollars only. No checks, debit, or credit cards will be accepted. All sales are first come, first served and are subject to on-site availability. All sales are final; no refunds, no exchanges, no returns and all items are sold in “as is” condition with no warranties or guarantees of serviceability provided or implied. All items are tagged with a two part numbered tag. If items cannot be carried to the cashier with relative ease, then customers should tear off half the tag of the item they want to purchase and bring to the cashier. The cashier will record the tag number on your receipt. Please present the PAID stamped label to an MWR staff member before you remove items from the sales areas. MWR may limit entry to 50 shoppers at a time within the facility for safety reasons. * The sale is open to US ID-Card holders only. You must have an ID card to enter the store area. No sign-ins, no non-ID-Card holder guests. * All sales are final. No refunds, no returns, no warranties or guarantees implied or otherwise given. All merchandise is offered for sale in “as is” condition. Customers are responsible for any disassembly or reassembly required to remove all purchases from the sale site. * Some items may require administrative action (paperwork) to clear them from the installation property records. This step is important to the customer to prove legal transfer of ownership. * The sale inventory is a wide array of excess, obsolete, and replaced equipment and supplies. All items are deemed to have some usable function. In accordance with AR 250-1, MWR sales may be conducted periodically to dispose of excess resale merchandise and supply inventories from NAF/Uniform Funding Management (UFM) property items that are no longer useful in the provision of NAF services. Family and MWR NAF/UFM property belongs collectively to soldiers and the extended Army family. Therefore, its sale must be performed in a manner that returns the maximum revenue to MWR for Soldier program support. Only identification card holders are allowed to purchase excess MWR NAF/UFM items at this sales event.